The femtocell industry has traditionally been dominated by start up companies dedicated to building small cell products such as 3 Way Networks, Ubiquisys and ip.access. However, as wireless broadband traffic forecasts have continued to highlight trends such as the high demand for capacity indoors and a high proportion of traffic being generated by a small proportion of users the case for smaller cells has gathered support. This was demonstrated at Broadband World Forum last week where operators agreed that capacity bottlenecks won’t be solved by spectrum efficiency improvements of 4G alone and that smaller cells will be needed . Recent auctions of spectrum at both 800MHz and 2.6GHz in Germany have also facilitated plans for a two tier network topology, further fuelling the interest in smaller cells . This growing interest in smaller cells has led to some big industry players joining the traditionally niche and UK centric femtocell ecosystem. For example in March this year Qualcomm announced that it would be providing its femtocell chipset to ZTE . Most recently Broadcom has entered the market by purchasing the Israeli femtocell chipset vendor Percello . Freescale has also recently joined the Femto Forum and has announced their intention to develop LTE System on a Chip (SoC) platforms suitable for femtocells . This is perhaps an expected development to match the femtocell platform product range already launched by FSL’s rivals TI. It’s good to know your niche in the ecosystem and to stick to it– One of the success stories of the femtocell industry to date is the rise of picoChip. Established initially as a flexible baseband processing solution for software defined radio platforms, picoChip were quick to pick up on the promise of femtocells and have focused their product roadmap around producing a cost optimised off the shelf femtocell PHY chipset with an onboard processor to allow femtocell access point vendors to add their own higher layer stack and interface to the femtocell gateway. 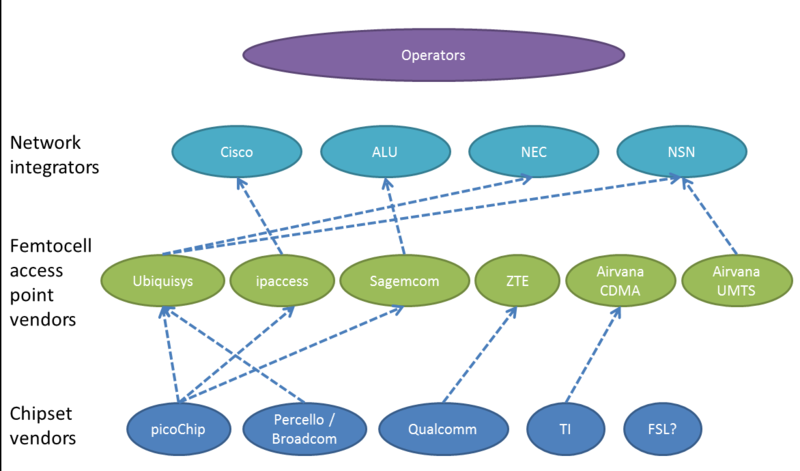 Making a clear decision to be a chipset vendor and sticking to this vision has also produced dividends for Percello who were recently acquired by Broadcom. Know your target market; home or enterprise– Traditionally the femtocell industry has focused on the home market. However, more recently femtocell vendors have turned their attention to the enterprise market which requires providing coverage to more users and over a larger cell radius in an office rather than home environment. These are two very different markets with different cost considerations and technical challenges. In the residential femtocell market a low unit cost is key and backhaul restrictions are a big concern. The enterprise market is not as sensitive to cost and while backhaul may not be as much of a concern in an office environment the number of users and throughput will be. Vendors trying to serve both markets may well be left with comprises in their product that a more focused vendor hasn’t had to make. 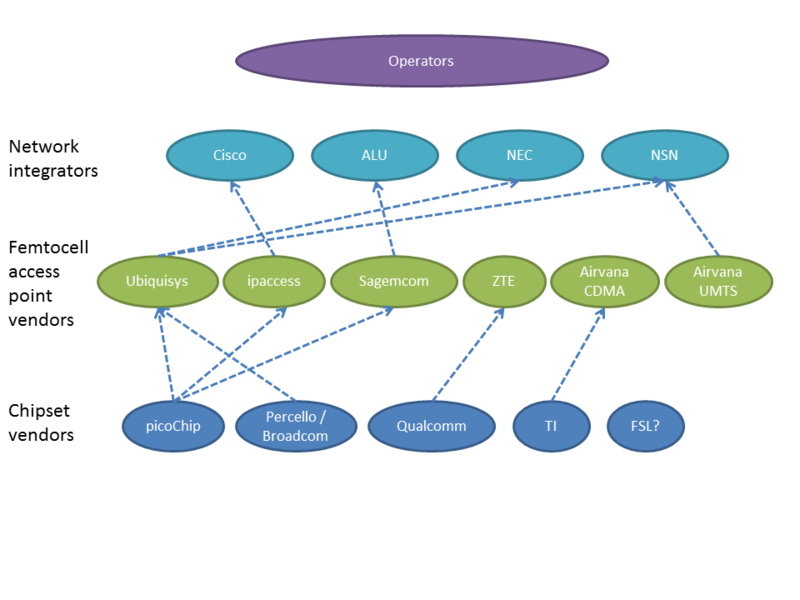 Over the next year it will be interesting to watch how the increasingly congested femtocell ecosystem evolves and whether the smaller vendors with more experience in this sector will be able to navigate their way past the challenges of the better known but relative newcomers to the femtocell industry. Femto is rapidly becoming the standard unit for small cells. This is all to do with cell intelligence that characterises femto, not on the size of the cell. On additional development is the ability of femtos to use their intelligence to autonomously form self organising networks. These are already in use in enterprises in Europe, but the technology applies equally to outdoor small cells.